The annual Phimai festival takes place this year from the 11th to 15th November 2015. 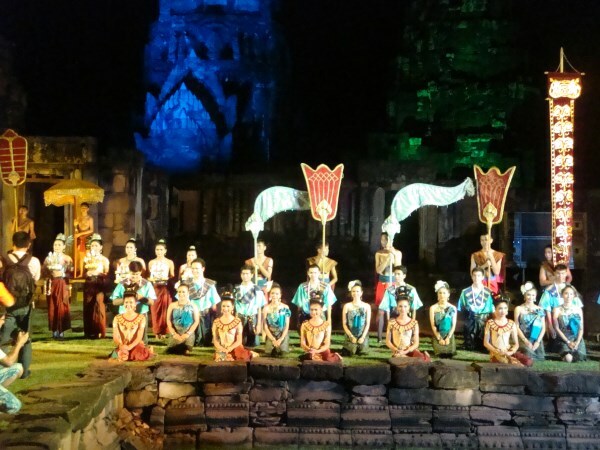 Events include long boat racing, a Korat cat contest, music concerts and a musical show each evening at the Phimai historical park. Other events will take place and in the centre of the town stalls have been set up that will sell food, drinks and various other items. 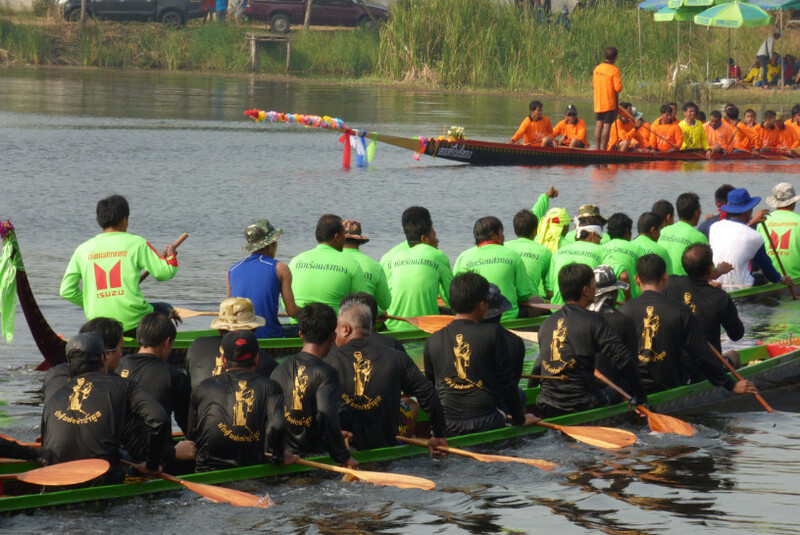 The long boat racing this year is scheduled for Saturday 14 and Sunday 15 November in the usual location in the town, Lam Jakaraat. Good views of the racing can be had along the sides of the river and from the bridge on Anantachinda Road. There will be a series of music concerts for five days of the festival – from 11 to 15th November. The Mahahing band kicks off this years concerts on 11 November, Pongsit Kampee will perform on 12th November, Ja Gan Hoo on the 13th November, Labanoon will play on 14th November, and Wong Gang-geng play the final concert on 15th November. Come to Phimai and enjoy the festival. 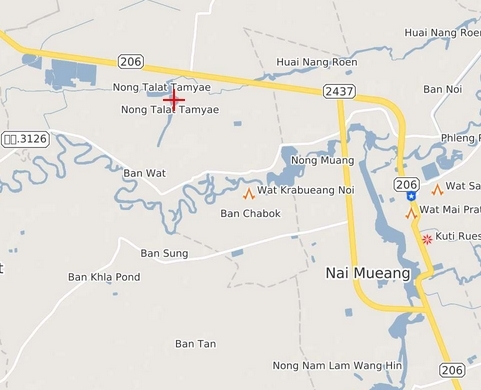 This coming weekend (31 October and 1 November) there will be longboat racing in Tam Yeah (ตำแย), organised by the sub-district of gra-bueang-yai (กระเบื้องใหญ่), small neighbouring villages about 4 miles from Phimai town. Below is an image from last year’s longboat racing event in the same location. Below is a map showing the approximate location of the racing. 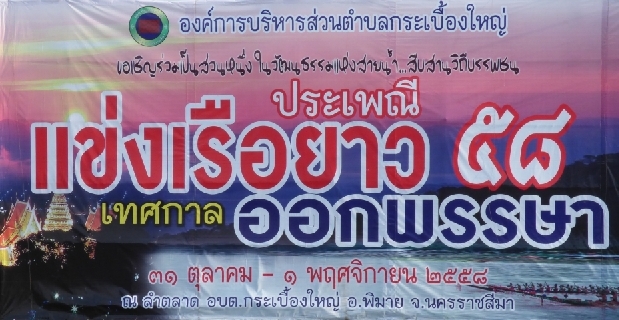 Next month will see the Phimai festival in Phimai town. 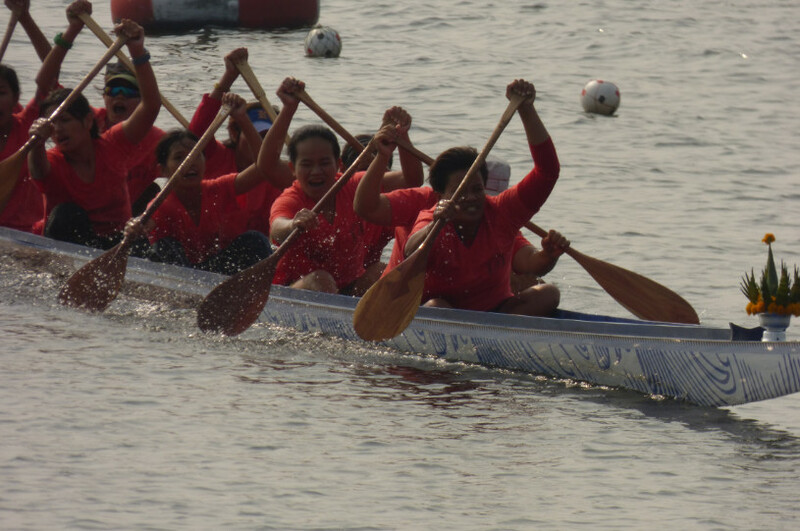 Longboat racing is scheduled for 14-15 November in the usual location, Lam Jakarat. Good views of the racing can be had along the sides of the river and from the bridge on Anantachinda Road. More details to follow on this year’s Phimai festival. 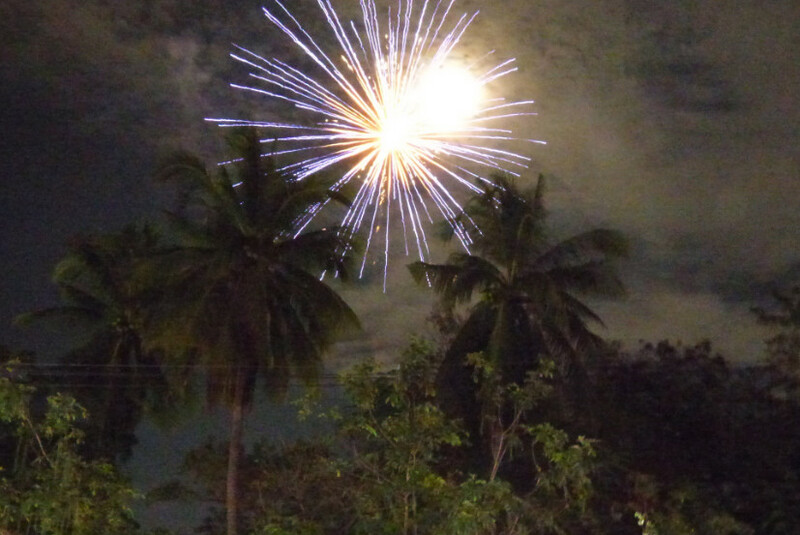 The loy gratong festival takes place in Thailand in November when there is a full moon. Loy Gratong literally means “float gratong”. A gratong is typically a small decorated receptacle made from banana leaves and a piece of banana tree trunk, although sometimes they are made of other materials (foam, for example) and sometimes they are very large. The gratongs are floated in rivers, canals, ponds and anywhere else there is water. You can make your own gratong or you can buy one. You will find many people selling them. Prices vary depending on size. 20-30 baht is common but bigger ones can cost more. A candle on the gratong is lit and often a small coin is also placed on the gratong. 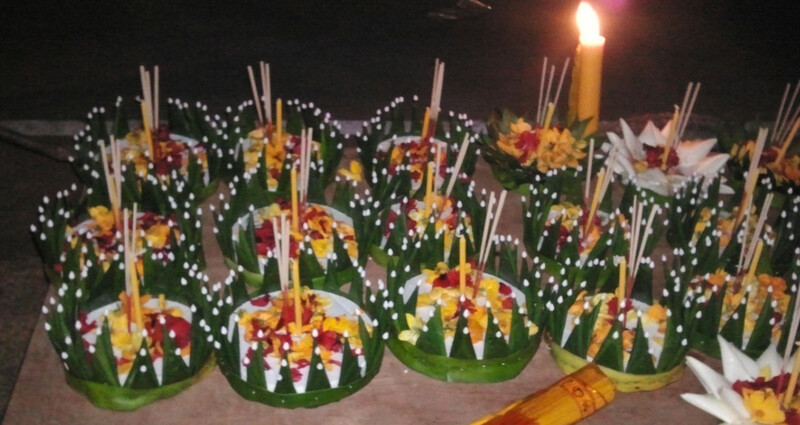 Traditionally Thais floated a gratong as an apology for any harm they have done to water in the last year but nowadays people usually make a wish as they launch their gratong. The scene can be a beautiful sight for a few hours but in the morning the water is in a worse state than 24 hours before. The loy gratong festival usually includes food, markets, music, singing, dancing and games. 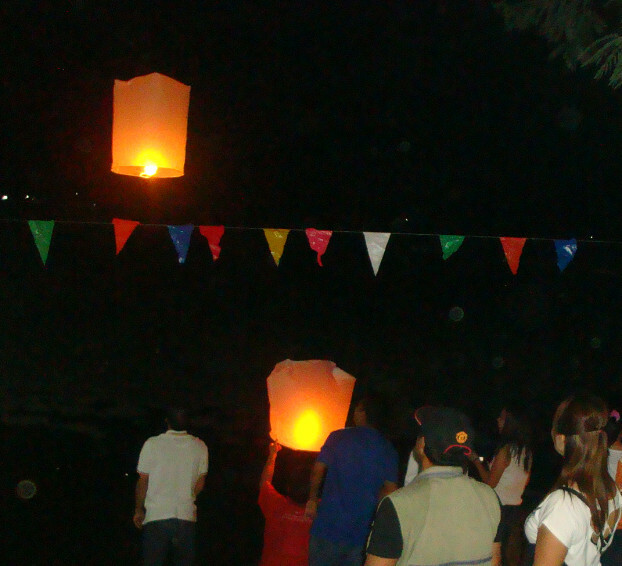 Fireworks are also let off and so are floating lanterns. Enjoy the loy gratong festival in Phimai today, the 6th of November 2014. 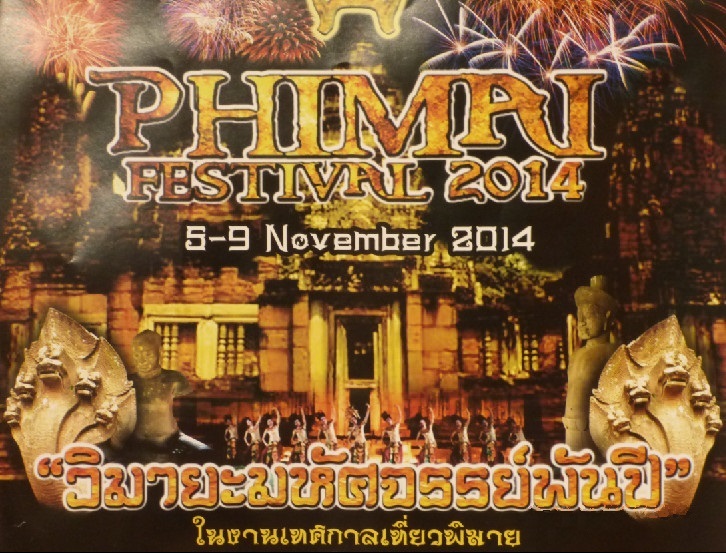 The annual Phimai festival will be held this year from the 5th to 9th November 2014. Events include long boat racing, a Korat cat contest, a bird contest, singing, Thai dancing and a show at the Phimai historical park. Other events will take place and in the centre of the town stalls have been set up that will sell food, drinks, clothing and various other items. 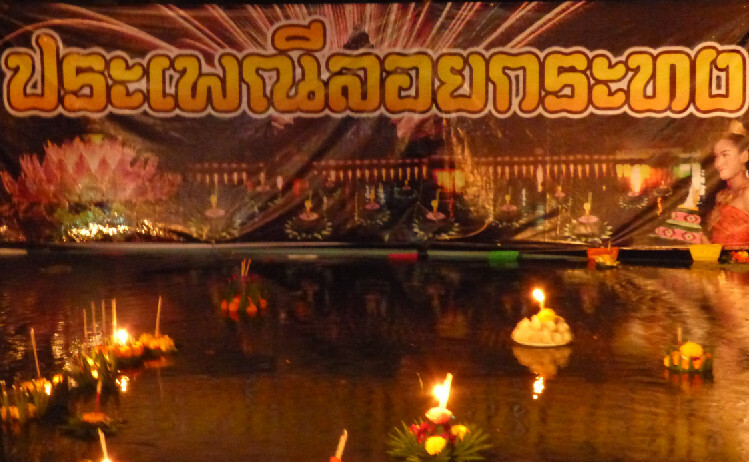 Tomorrow, 5th November, there will be a Thai puppet show in the historical park. It is scheduled to start at 6pm. 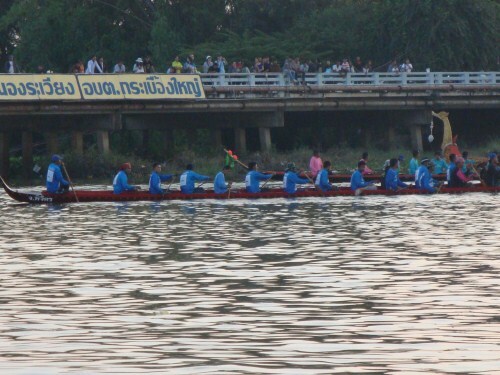 The long boat racing this year is scheduled for 6-9 November in the usual location, Lam Jakarat. Good views of the racing can be had from the bridge on Anantachinda Road. 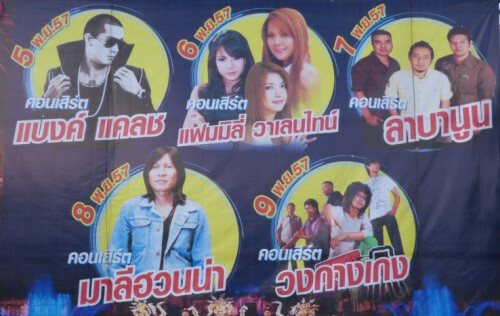 There will be a series of music concerts on each day of the festival. Bank from Clash will appear on 5th November, Family Valentine on 6th November, Labanoon on 7th November, Malihuanna on 8th November and Wong Gang-geng on 9th November. 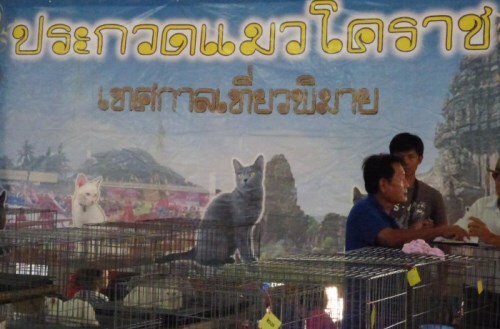 The Korat Cat contest takes place in the afternoon of Saturday 8th November in the local government building (amper). The bird show takes place on Sunday 9th November. Phimai is a great place to see longboat racing. 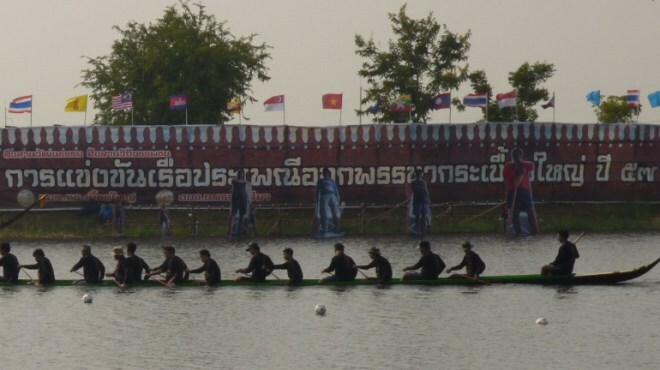 Every year during the Phimai festival in November there is longboat racing. This weekend (11-12 October) saw 2 days of longboat racing in gra-bueang-yai (กระเบื้องใหญ่), a small village about 4 miles from Phimai town. The longboat race course – a straight line. A women’s team winning their race. 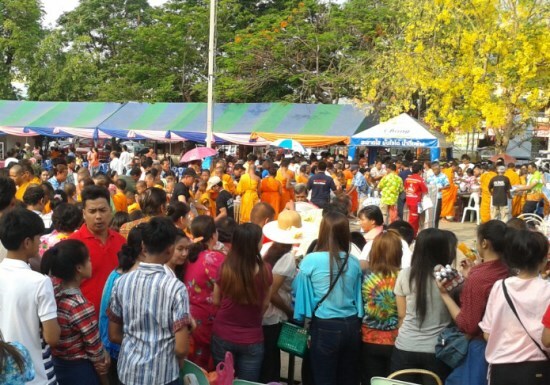 The event was held to mark the end of Buddhist Lent (ork pansa –ออกพรรษา), which was on 8th October this year. 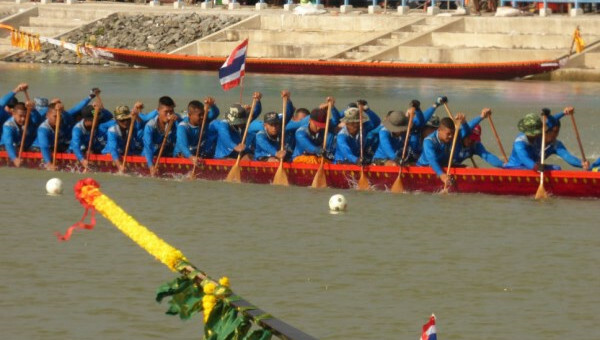 It was the 16th annual longboat racing event to be held in gra-bueang-yai, Phimai district. 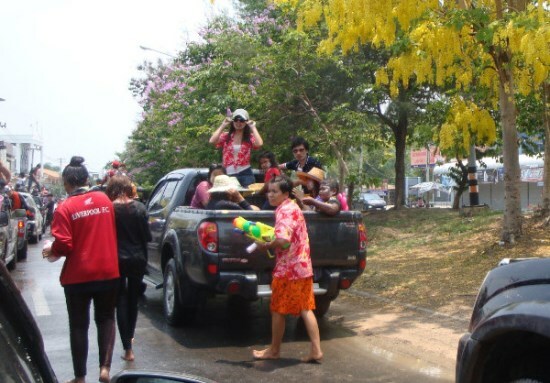 The annual Songkran festival takes place each year on 13th, 14th and 15th April. 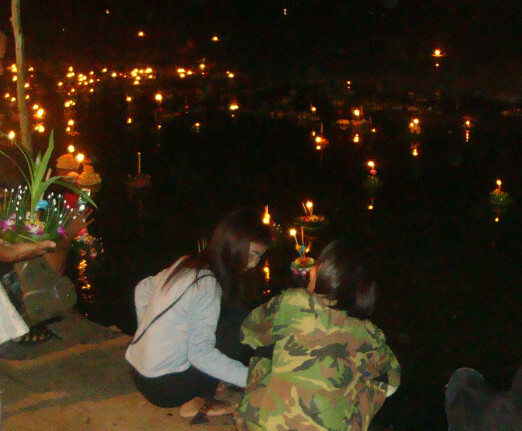 The festival celebrates the Thai new year, which is on 13th April. There are different aspects to Songkran in Thailand. One is considered the traditional aspect to it, which is the gentle and respectful pouring of water over the hands of ‘seniors’, senior either in age or status, or of other people you respect (parents or teachers, for example). 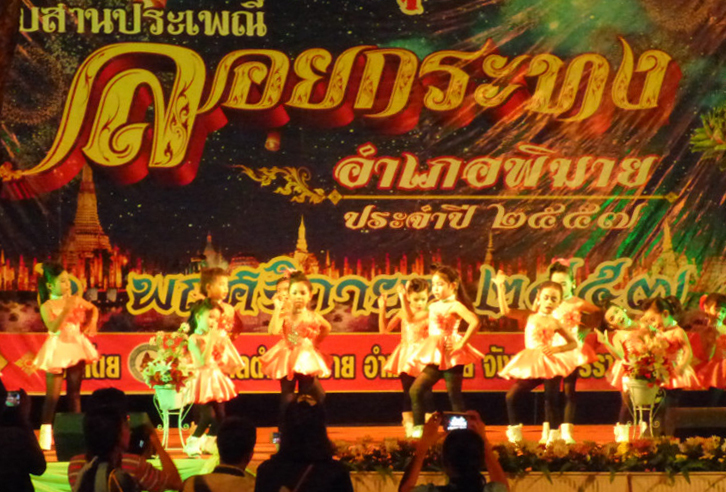 This side of Songkran is popular with the older generation. 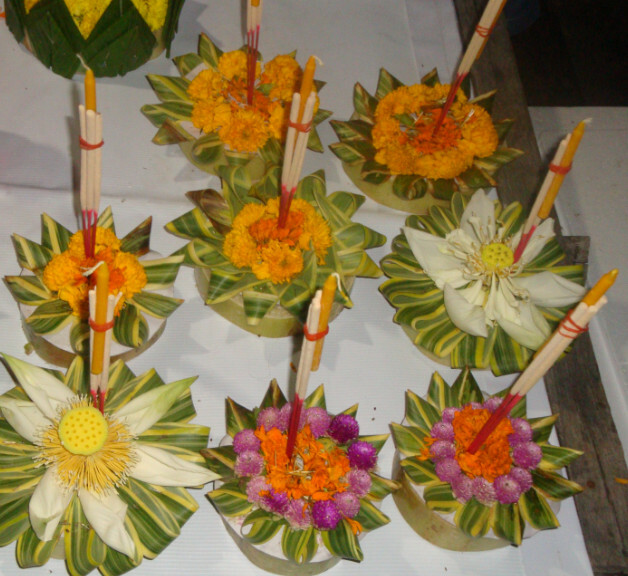 Some Thai Buddhists also take the opportuity to ‘make merit’ by giving things such as food, flowers and money to monks. In Phimai, lots of people gathered together to do this at the town clock at 8am on 13 April. See picture above. Another aspect to the festival is throwing water at people. Arguably, this is the most popular aspect of Songkran, especially with the young or young at heart. As April is usually the hottest month in Thailand, this part is not only great fun for the participants, it’s also a great way to keep cool for a few days while letting go of your inhibitions. Many people use water guns to soak other people while others use buckets or smalll plastic bowls to scoop up water to throw at others. Water fights take place on road-sides up and down the country. See picture above. Invariably there are many traffic problems during the Songkran festival. Some parts of towns and cities in Thailand become gridlocked with traffic crawling along and people singing, dancing and throwing water at each other throughout the day. In Phimai town, the roads near or leading to the Banyan tree area seemed to me to have the most cars and revellers this year. Thai authorities encourage people to end each day’s water throwing at about 6pm or 7pm. By that time, the loud music is usually greatly reduced. Long boat racing above. Sound and light show below.